Absi brass medals have natural brass color with light brownish shadows, achieved by cold patinas where brass medals are dipped into a chemical solution. They can also be ordered to be nickle-plated instead. You can select between three different types of surface-finishing: satin, matte and brilliant. Absi brass medals can be with or without color filling. Color-filled medals must be engraved in recess (sunken relief, where black areas of the design are engraved in recess and can be color-filled). Absi brass medals are circular in shape, cut from from brass sheets 2 mm in thickness, single-faced and carry a two dimensional (2D) impression. A range of sizes are available (diameter in mm): 50, 60, 70 and 75. Absi brass medals are etched or minted (depending on quantity) from 2 mm thick brass sheets. 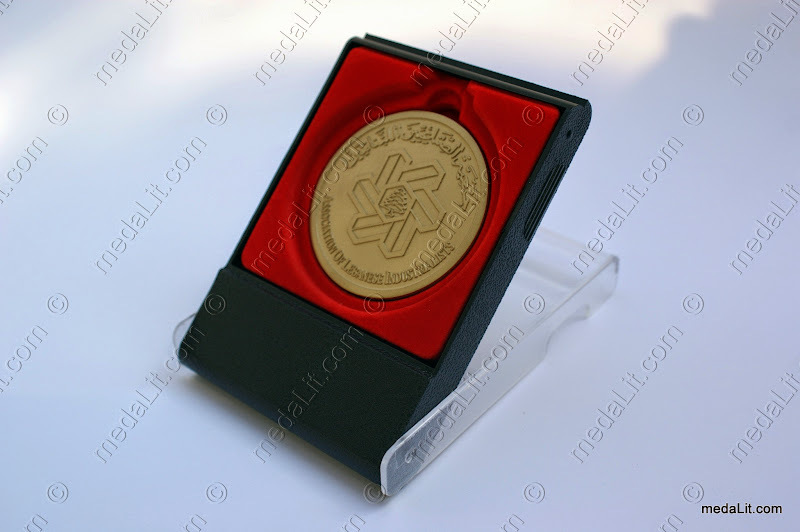 Absi brass medals have two dimensional embossed or recessed impression. Any design can be rendered. 2D medals are engraved without contouring using 2D black and white (inked) artwork which includes usually your message (text) and logo (drawing); black areas are rendered as recessed and white areas as embossed. The result of using such artwork is a 2 dimensional low relief medal with only two levels on the medal's surface.